Save for the first golden rays of sunshine over the “Sassi,” most of the ravine is still covered in darkness as we wave goodbye to the marvels of Matera. The route to the other side of the ravine is long and abounds in caves and Rupestrian churches carved out of the rock side. The churches are from different epochs, the majority of which date back to the Late Medieval Period, and the most interesting house Byzantine frescoes and sculptures. The churches stand as a testament to the significant, centuries-old presence of Byzantine and Benedictine monks who devoted their lives to prayer and contemplation in this evocative, rock-and-shrub strewn wilderness overlooking the ravine. Each merits an extensive visit to fully appreciate its rough beauty, but we can only make so many stops en route to Calabria. Our first is to Cristo la Selva, a church with a Romanic façade and square floor plan. Inside this enchanting space you’ll find frescoes of Saints John and Joseph, and a magnificent, wrought iron candelabrum. Next up is a group of grottoes occupying four different tiers linked by a network of white stone stairs and tunnels. Amid this group is San Nicola all’Ofra, a little church consisting of a single- nave chapel with a seashell niche and a fresco depicting the Madonna and Child. As we climb down toward Montescaglioso, we’ll make another stop at the Cripta della Scaletta. The view and setting here are breathtaking. The leafy plants and shrubs add to the landscape’s splendor and signal to us that we’re close to Murgia. The little rock-hewn temple has a stone wall dividing the presbytery from an area reserved for worshippers. Back on the road, we make a windy descent toward Bradano. Here, the river coils through rushes and vegetation, which, at the start of spring, is nearly bursting with deep greens. In the distance, an eastern sun dapples the blue and turquoise Ionian Sea. 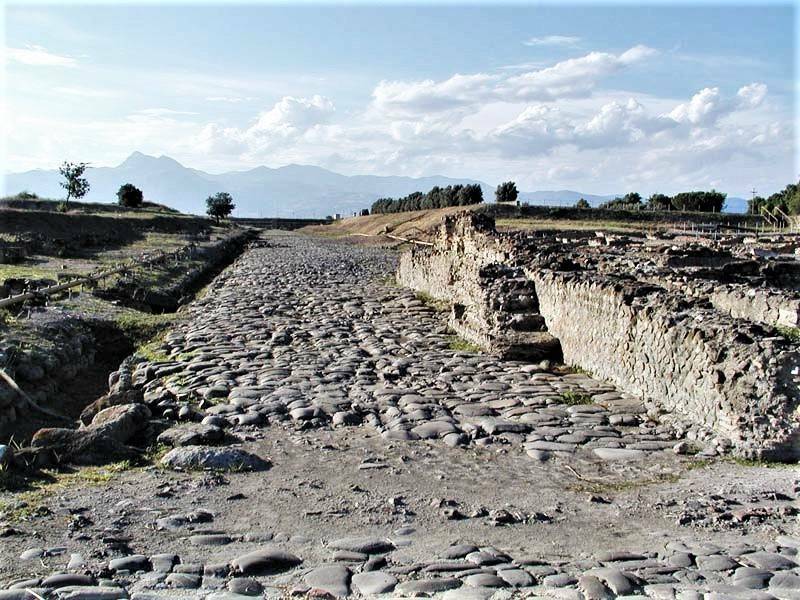 Prior to Metaponto, we’ll turn onto the Ionic highway that carries us to Calabria, but not before we pay a visit to Policoro, where, in the 7th century B.C, Heraclea was founded. One of the most vibrant of the Greek colonies, it extended from the Gulf of Taranto along the entire Ionian coastline of Calabria and on into Sicily, forming the area that would become known as Magna Grecia. From the archaeological ruins, we can discern an orthogonal urban plan, an acropolis where the Policoro Castle now stands, and sanctuaries dedicated to Demeter and Dionysus. The precious, open-air archaeological digs at the Siritide Museum provide proof of the wealth and refinement of the area’s ancient inhabitants, thanks to the influence of the Achaean civilization. The journey continues. A mix of salt air and eucalyptus drift up from the sea on our left. On our right, the large lush plain, once marshland, is getting ready to produce delicious fruit and vegetables bound for markets in Italy and half Europe. On the horizon, the mountainous profile of Pollino, with its crags and narrow gorges carved into its side by flowing water, slopes down toward the sea. We’ve arrived in Calabria. Those looking to escape the crowds are in for a real treat. In fact, we immediately come upon Rocca Imperiale, an ancient village crowning a hill. The village was founded around the year 1000 and, because of its proximity to the sea, fortified by Emperor Frederick II, the Duke of Swabia. Magnificent views can be had from its uniform houses, which are reached by a series of built-in steps that run all the way up the hill to the Castle, a Frederick-era construction resembling Lagospele and Lucera. Magna Grecia’s lushest strip of land often fell victim to the armies of Pyrrhus, Hannibal, the Goths, and Spartacus’ gladiators when they revolted against Rome. Now this countryside produces tasty lemons and other quality biological products. We proceed at a good clip, past rolling hills scored by gullies rising up to forest-covered mountains. Below us, the green of the sea gives way to rows of cacti, which in the summer turn yellow and red, and produce delicious fruit. More villages dot the hills, more towns the marina. On one hill sits the Swabian Castle of Amendolara. Further on, Trebisacce anticipates the Sibari Plain. There’s Cassano al Ionio, a scenic city with ancient roots that stretch back to the Neolithic Period. Neolithic ceramics and utensils were found in the karstic caves of Sant’Angelo. Here, in 720 B.C., the Achaeans founded Sibari. The colony flourished for two centuries until being destroyed by armies led by the famous Greek athlete Milo of Croton. Under the Romans, Cassano became Municipium. Then came a series of conquests at the hands of the Lombards, Normans, Swabians, Anjous, and Aragonese. In the decades spanning the year 1000, it was sacked several times by the Saracens. But let’s return to ancient Sibari for a moment. The port of the Greco-Roman city was the primary stopover in the West for merchants from Mileto selling precious goods from Asia. Sibari was famous for the wealth of its land and the refinement of its citizens. After its destruction at the hands of the Crotons in 510 B.C., Pericles ordered that the Hellenic city Thurii be built over Sibari’s ruins. Three centuries later, it became a Roman colony named Copia. Today the ruins of Sibari’s ancient city are visible at a large site where archaeologists discovered baths, a temple, a theater, and the remains of Thurii. Invaluable relics are kept in the Sibaritide Archaeological Museum. We set off once more on the arterial road that brushes up against the sea. The intense offshore colors of the Ionian turn to pearl nearer the golden shore. The water’s transparent. There’s a pleasant vibe. The small towns along the coast are modestly built and un-invasive as we draw closer to the turnoff for Corigliano Calabro. That city sits prominently on a hilltop. Its origins are probably Arabic, dating back two centuries before the year 1000. After the Norman conquest led by Robert Guiscard, the year 1073 saw the construction of the castle and church of St. Peter. The rest of the city developed around them. Corigliano was the fief of the Sangineto family, then the Sanseverino family. You can visit its beautiful churches—St. Peter’s Collegiate Church, the Carmelite Church of SS. Annunziata, the Church of San Antonio, and the church of Santa Maria di Costantinopoli, which houses an amazing 17th c. crucifix by Umile Pintorno. The mother church, Santa Maria Maggiore, was built in the 10th century and contains remarkable engraved wooden furniture and a 17th century painting attributed to Cesare Fracanzano. Also of note are the churches of Santa Anna and San Francesco di Paolo. The Castello Ducale is superb too. Not 15 miles on is Rossano Calabro, another magnificent city and home to a Diocesan Museum containing the Rossano Gospels, recognized by UNESCO as one of the oldest illuminated manuscripts in the world. This ancient city (c. 1100 B.C.) became a colony of Magna Grecia and a Roman outpost when Emperor Hadrian ordered the construction of a port that could hold 300 ships. For five centuries, until 1050, the city thrived under the Byzantines both economically and culturally, and it was able to ward off invasions from barbarians, Lombards, and Saracens. Thanks to its treasure trove of Byzantine art, the city earned the nickname “Ravenna of the South.” The delicate purplish parchment of the Rossano Gospels contains 188 illuminated pages written in admirably miniature Greek characters in gold and silver ink. It dates back 14 centuries. One of the codex’s scenes (the resurrection of Lazarus) resembles one of Giotto’s frescoes in the Scrovegni Chapel in Padua, as well as a fresco by Beato Angelico in Florence’s San Marco convent. The codex is an extraordinarily beautiful work. Behind Rossano, you can see the spur of Sila up above, a wide mountainous plateau that, along with Pollino and Aspromonte, forms the Apennine spine of Calabria. From Rossano we make our way toward Crotone. Halfway to Crotone is Cirò Marina, a beautiful city on the ancient site of the colony of Krimisa. Nearby, around Punta Alice, are the remains of a temple to Apollo. 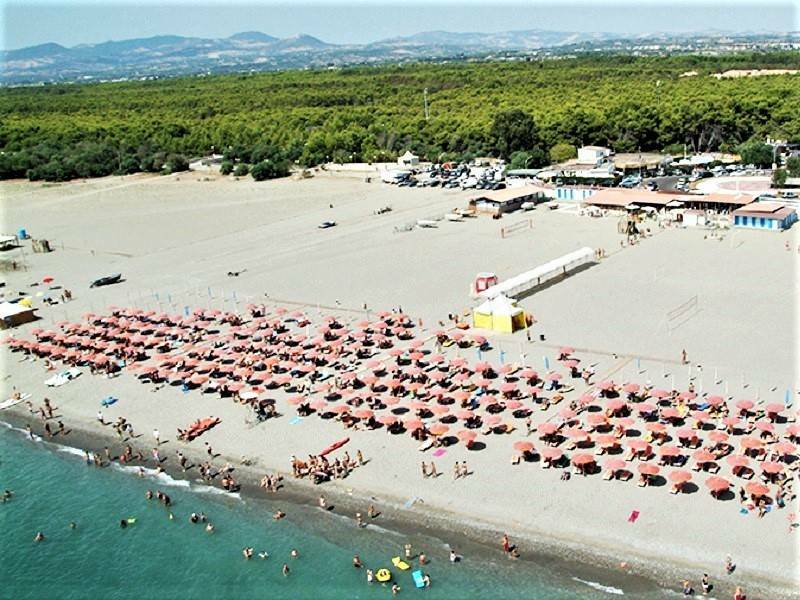 A popular beach resort known for its pristine waters and quality service industry, Cirò also earned a reputation for a wine of the same name made from Gaglioppo grapes, and a citrus fruit known as “Calabrian clementines.” The other wines in the area are Il Greco and Il Savuto. There are numerous monuments to visit in pretty Cirò Marina. Another 25 miles and we arrive in Crotone, the capital city of the province that has a population of 63,000 inhabitants. A former colony of Magna Graecia known as Kroton, the city is famous for its wealth, Pythagoras, and the school of metaphysics. 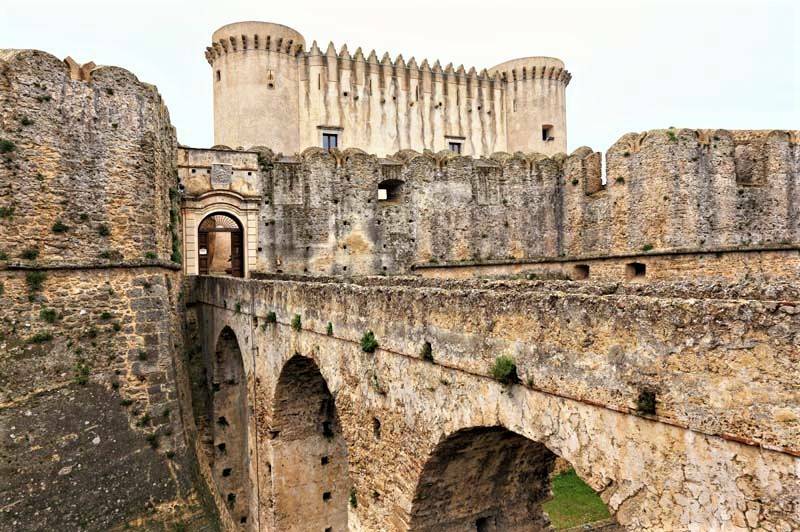 The imposing castle, situated on a promontory over the ancient acropolis, and the 16th century fortifications erected by the viceroy of Naples Pedro da Toledo to defend again Turkish invasions, surround the mazelike old city facing the massive port. (Crotone is, in fact, the largest industrial center in Calabria.) The cathedral is definitely worth a visit, as are the castle housing the civic museum, and the archaeological museum, which has artifacts from Capo Colonna and the area around ancient Kroton. 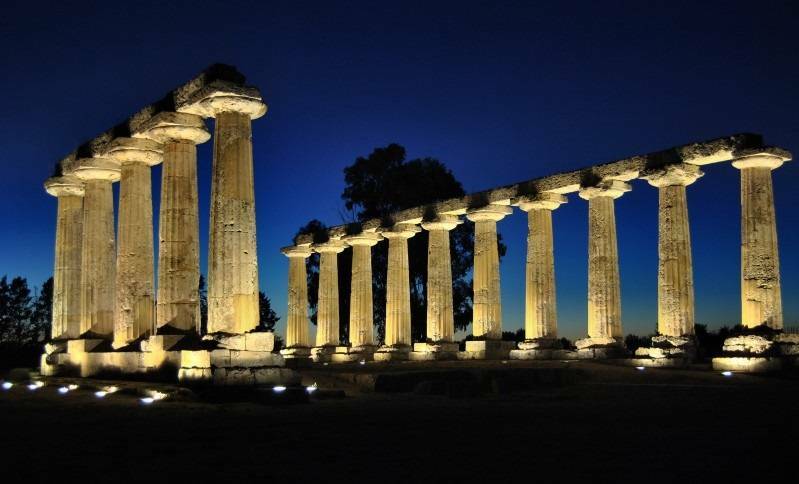 In Capo Colonna you can tour the remains of the Hera Licinia sanctuary (the base and column of a Doric temple are still standing). Grave goods, money, terracotta votives and other artifacts are on display in the archaeological museum. The coastal terrace from Capo Colonna to Capo Rizzuto is stunning: steep and rugged cliffs, bursts of Mediterranean scrub, little white sand beaches, and a sea that vaunts a variety of colors, from deep blue to emerald green, and a stupendous seabed of flora and fauna. This tract of coast has been declared a protected area by Capo Rizzuto and preserves an important environmental legacy. There are several well-established tourist facilities in the area. The coastal terrace runs all the way to Le Castella, an islet with a small Aragonese castle that now functions as a welcome center. Our journey ends (for now) in this enchanting place. * Writer and journalist Goffredo Palmerini continues his fascinating journey through the beauty of Italy.